Learn the Harlem Globetrotters electrifying skills and tricks! 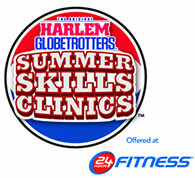 Bring your boys and girls ages 6-14 to a first-time-ever Harlem Globetrotters summer basketball skills clinic! A great way to stay active while having fun! We did receive compensation for this post, but all thoughts are our own.